Fiskars Premier Razor-Edge Softgrip Scissors make it easy to cut through multiple layers of heavy material — even denim and leather — with minimal hand fatigue. Hardened stainless steel blades feature a specially ground edge for maximum sharpness and are tested to cut all the way to the tip — essential for anyone who cuts fabric. Fiskars' exclusive, ergonomically sculpted Softgrip handle provides unmatched cutting control and comfort while reducing hand fatigue. The bent design helps keep materials flat for precise, mistake-free cutting every time. 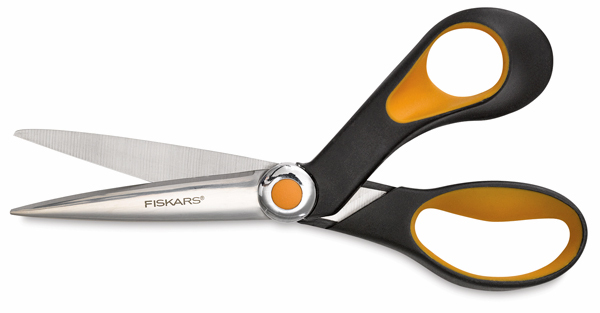 Like all Fiskars cutting tools, Fiskars Premier Razor-Edge Softgrip Scissors are backed by the manufacturer's lifetime warranty. For right-handed users.